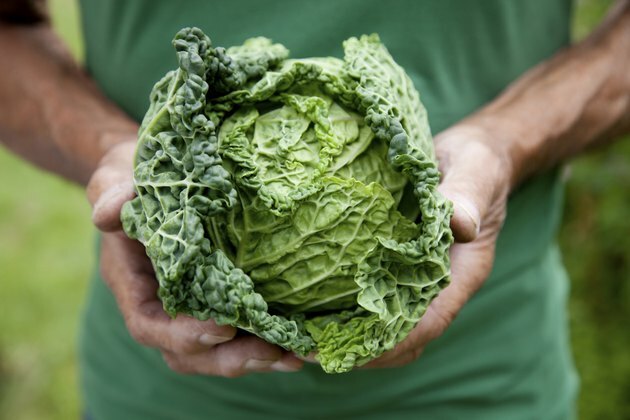 Cabbage is difficult to digest, which can lead to gas in the intestinal tract -- a common cause of cramping or pain in the abdominal region for some people. While experiencing pains due to gas is common, an underlying digestive disorder or food poisoning could also be to blame. If you experience severe cramping for an extended period or have other symptoms such as fever, vomiting or diarrhea, consult a doctor immediately. Stomach cramps are a term commonly used for pain in the abdominal region, even though the stomach is not always involved. Gas trapped in the intestines -- usually in the large intestine -- is often described as a cramping sensation. Most intestinal gas is caused by either swallowing air while you are eating or the normal breaking down of food in the digestive tract. If the gas is excessive, bloating, cramping and nausea can occur. Several foods cause excess gas in the digestive tract because they are difficult to break down and digest. Cabbage is one food that the University of Michigan Health System recommends avoiding for this reason. Intestinal gas is usually temporary and often goes away after a bowel movement. Cabbage is hard to digest, primarily because it contains a complex sugar called raffinose. Raffinose is also present in beans, Brussels sprouts, broccoli and asparagus, according to the John Hopkins Medicine Health Library. Raffinose requires a specific enzyme -- known as α-galactosidase -- to break down into its essential components. Human beings do not have that enzyme in their small intestine or stomach, so cabbage gets passed down to the large intestine where the bacteria there work at breaking it down. This process creates a lot of gas, which can lead to bloating, cramping and flatulence in some people. One cup of raw cabbage has approximately 1.5 grams of fiber, according to Harvard University Health Services. Fiber is also hard to digest and can contribute to the buildup of gas in the intestines. Raw cabbage that has not been properly washed, packaged or cooked can contain harmful bacteria, which can lead to food poisoning. Food poisoning is usually the result of a common bacteria, such as salmonella, staphylococcus or E. coli, according to MedlinePlus. Food poisoning symptoms can include cramping, gas, bloating and diarrhea. More severe food poisoning can induce symptoms such as fever, chills and overall weakness. Serious food poisoning requires immediate medical treatment. Although death from food poisoning is rare, five people in Japan died in August 2012 from food poisoning caused by E. coli in pickled cabbage, according to the Tropical Medical Bureau. Eating cabbage does not cause cramping or gas in everyone, but it is still difficult to digest. If you have an underlying digestive disorder, the difficulty in digesting cabbage could translate into symptoms of the disease flaring up. Digestive disorders such as irritable bowel syndrome, IBS, or small intestine bacterial overflow, SIBO, are milder diseases that often include abdominal pain, gas, belching and burping as symptoms, which can be made worse by consuming hard-to-digest foods. Other more serious diseases, such as Crohn's disease, might have cramping and gas as an early sign. Avoid raw cabbage if it causes you severe gas and cramping or if you have an underlying digestive disease. If you have to have cabbage, cooking it may reduce cramping, as well taking an enzyme supplement to help break down the raffinose. Washing raw cabbage and cooking it thoroughly may help prevent food poisoning. Consult a doctor if your cramping is severe or continues for more than several hours.